Hatters midfielder Olly Lee was relieved to see his attacking intent pay off by notching a fifth goal of the season in the 4-1 win over Crawley Town on Tuesday night. The 26-year-old had been without a goal in his last 12 games, since finding the net at Gateshead in the FA Cup back in December. However, that all changed in midweek when he received James Collins’ pass and hammered past Red Devils keeper Glenn Morris with the aid of a slight deflection. Speaking afterwards, Lee said: “I haven’t scored for a little while and it's been playing on my mind a little bit. “Sometimes these things happen when you don’t score a for a while, but hopefully I can go on a little run, get some shots off and a few more goals. “I just thought I’d take a touch and have a shot. I haven’t been shooting as much as I’d like the last couple of games, so it was a thing coming into the game where I thought I’d get three shots off. “Thankfully I did that and one of them went in so that was good. “The goalies always seem to up their game when they come here, always seem to play well. Fellow midfielder Luke Berry was on target too with his seventh of the campaign, as Luton ended a run of four games where they had been relying on their strikers to score. However, it wasn’t something that had been playing on Town’s mind though as Lee continued: “It’s not really talked about, we’re players who think we can score goals in this league. “It’s just a case of it all coming together, so it was nice. “Me and Bez like try and get on the scoresheet and try to chase them (the strikers) as hard as we can. “I’m trying to chase my brother (Elliot Lee) as well. James Collins scored two as well, as Luton tucked away four goals, equalling the tally they had managed in their last three outings combined at Kenilworth Road. It took them on to a mightily impressive 72 goals for the campaign, 49 of them coming on home soil, as Lee said: “Credit to them (Crawley), it makes a nice change for a team not to come here and boot it long, waste time from the first minute. “They tried to give us a game, but we’re a very good team in this league and when teams come to play against us, we can show them what we’re about. "It was a good night at the office. We’ve been due a high scoring game, so it was nice that we can finally put a few goals in the net and make it a little bit more comfortable than the last couple of weeks. 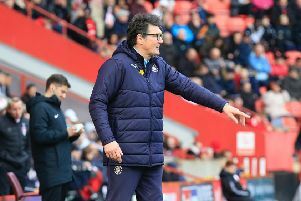 “We thought we could have had a penalty in the first minute, so we started on the front foot, that was always the plan, and thankfully all the attacking play we work on came to fruition. “It’s always massive getting that first goal and if we get it in the first half, we usually tend to kick on. “That (Collins header) settled us a little bit. We needed that second goal. It's always nice to get that cushion, then we came out (for the second half), we knew it was big to start well and we did that. "It’s always nice to get third and then you can not relax and take your foot off it, but you can manage the game a little bit better and you know you should be all right. “We made sure, you know what the gaffer’s like though, he stays on us to be pressing, be on the front foot the whole time.